fee for pet care or in the case of any damage. Take into consideration your pooch’s personality. Is he or she normally shy or super outgoing? Are they easily stressed around lots of people? Having your dog there is just as important as any other member of the family, but you don’t want them there if it means they will feel unhappy or confused. Designate or hire someone who will keep an eye out and can make sure your pup gets food, water and walks during the ceremony and reception (and also to keep them away from your delicious cake!). Make sure whoever you choose for this is not in the wedding party. It is also important that you leave your dog in the care of someone they know so they will be comfortable and at ease. Some opt to have their dog play a flower girl or ring bearer, or to just be up front with them as they exchange their vows. If your wedding party is already planned out, see if you can find someone who will walk your dog down the aisle. We happen to think a cute flower girl would make the perfect (and most adorable) person to accompany your dog! Sometimes we just never know how a dog will react. We love our pups, but just like people, they have their moments! If your dog is acting upset or not wanting to go along with the wedding have a Plan B of what to do incase things don’t work out. Who will take the dog, whether it’s back to your house or another location. 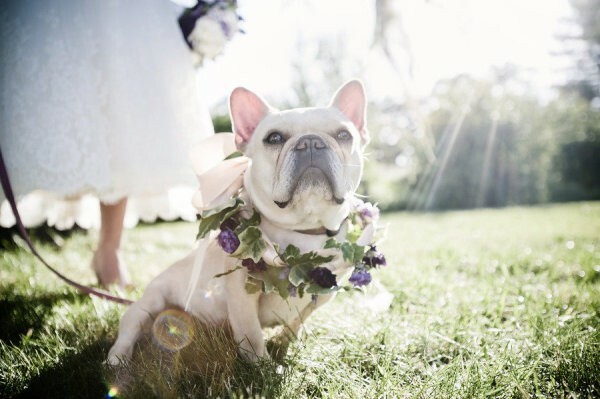 Keep the dog loving going and include your pooch in your wedding photos! If you have a photographer already talk to them about including your dog in some shots or if they can accommodate to that. If you are unable to bring your sweet pup to the actual wedding, plan before hand to include them in some engagement shots. Talk with a photographer about accommodating to taking photos of you as a couple with your beloved dog. There are many photographers out there who taylor specifically to involve pets in their pictures! Not doing engagement photos? No problem! There are a million ways you can include your dog without having them on site (although we are a fan of having them there, we understand sometimes that’s just not realistic). Including them on the invitation, party favors or decorations are just a few easy ways to make sure your dog is involved. There are a variety of artisans and stores that will personalize to what you want.